Despite my love of oats and muesli, I must admit I could not resist a recent supermarket promotion which saw Be Natural breakfast cereals on special for $2 per 405g box. Bargain! What began as an innocent 'taste test' has lead to a highly desired new breakfast option! You'll find Be Natural cereals in major supermarkets in 4 varieties: 5 wholegrain flakes, Manuka honey and spice clusters, cashews with almond, hazelnut and coconut, and the Pink Lady Apple and Flame raisin variation which I trialled and thoroughly enjoyed! 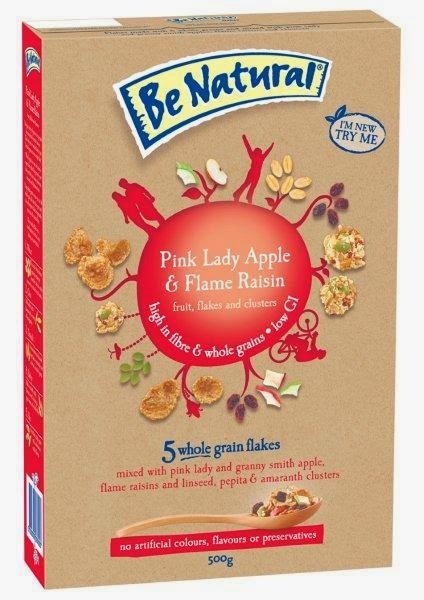 Be Natural Pink Lady Apple and Flame Raisin fruit, flakes and clusters: What's good about it? 1. 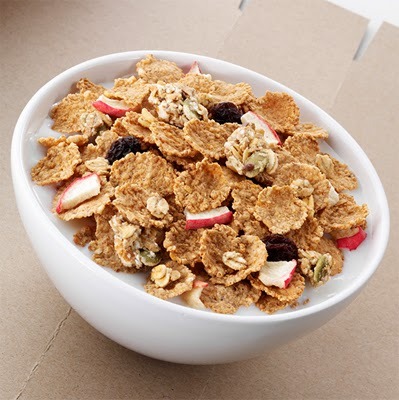 Wholegrains: This cereal is based on 5 high quality wholegrains - whole wheat grains, oats, triticale, barley and rye. Whilst a lot of breakfast cereals are highly refined and have minimal fibre, this one supplies 10.2g of fibre per 100g of cereal, which is quite impressive. (By comparison, 100g rolled oats supplies 9.5g fibre). This high proportion of wholegrains and great fibre content helps to keep your appetite and energy levels in check throughout the morning, assists the management of blood sugar levels, provides essential vitamins and minerals and helps keep you regular! 2. Low sugar content - Delicious pieces of dried pink lady and granny smith apples, combined with raisins, give this cereal a suitably sweet flavour. There is some additional 'sugar' or sweetness added to this cereal in the form of raw sugar, brown rice syrup and honey, however these are added in seemingly low proportions. Impressively, this sweet tasting cereal contains just 15.5g of 'sugar' per 100g of cereal, which is well within the limits recommended by health organisations such as the Australian Government and Baker IDI heart and diabetes institute. 3. Low in fat - The main sources of fat in this product would be the linseeds and pepitas (pumpkin seeds) and a small amount of added oils. Rest assured, these inclusions provide valuable levels of healthy fats which can actually help to reduce your risk of heart disease. Having said that, this product is low in fat overall, providing just 4.5g total fat and 0.6g saturated fat per 100g - again well within the recommendations of the aforementioned organisations. 5. No artificial colours, flavours or preservatives - The ingredients list of this cereal certainly is free of any added artificial stuff, as is advertised on the front of the pack. It's reassuring to read that Be Natural "passionately believe that simple natural ingredients are the best" - so that is exactly what they supply! This company even supports Landcare and environmental protection; that's why the cereal box is made from 100% recycled material! Got to love an environmentally friendly company! 6. Great taste and texture - I really enjoyed both the taste and texture of this product. As mentioned above, it has a suitably sweet flavour, paired with that deep nourishing flavour of wholegrains. I liked the crunchy texture of the wholegrain flakes, however this was easily softened with a decent splash of milk and a few minutes standing time, if crunchy is not your thing. Most of all, I loved the addition of the 'clusters' of linseeds, pepitas and oats for some added crunch and sweet pop hidden amongst the flakes. Overall, I would not hesitate to buy this product again, and I highly recommend it for a tasty, healthy breakfast cereal option. Actually, why limit it to breakfast? It makes for a great snack too! Until next time, eat well, stay well and please send any comments or topic requests my way! ** Please note the thoughts and information provided in this post are my own and I have no affiliation with the Be Natural company. If you would like more information about any Be Natural products, you can check out their website.